This is one of my favorite recipes of all time. I could drink it by the gallons. It was served at my sister's wedding and I got the recipe from her mother -in-law, Jill. Combine sugar in water over low-medium heat until completely dissolved. 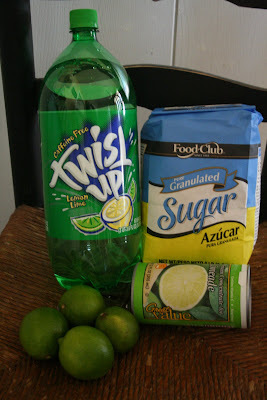 Mix with prepared limeade, and pour into big container. Freeze overnight. (it depends on the freezer too~I always make it ahead of time so it has at least 24 hours to freeze) Take it out a couple of hours before serving to let it thaw a little bit. 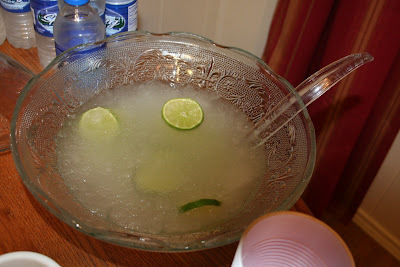 Chop up with spoon in punch bowl until slushy. Pour 7-Up/Sprite over and serve. I always like to float limes on top and you can always add some cranberries for Christmas red and green. Enjoy! I think this is the recipe that my mother in law and her sister make-except they add gin:) Sounds yummy! Have a great Thanksgiving!! What a great recipe just in time for Thanksgiving! It sounds way yum-O!!! I am defiantly going to have to try it! Yummy! This sounds so good. I love limes. I'm trying to think what kind of container would hold all of that to freeze -- what did you use? Everybody is coming over to my house for Thanksgiving. That would be delicious! Oh, Yummy! I miss having this drink at 33rd ward Enrichment nights! For that matter, I miss 33rd ward Enrichment nights! Thanks so much for posting this recipe! We had this for Thanksgiving and it didn't even make it to dinner. I'll have to have 2 batches next time! Delicious! Hey! I was just wondering how many servings this recipe makes. :) Looks great!